ScotRail has unveiled a £18m plan to try and improve its performance for passengers. Leasing three extra trains and hiring more staff - including 55 drivers and 30 conductors - is part of the bid to improve its service. The plan was demanded by Scottish government after months of disruption to rail services. The remedial strategy will also see information screens upgraded at 16 stations. A new report by ScotRail says a spike in staff leaving led to many of the problems the rail operator faced last year. The firm refused to say how many drivers have left but the report states that "in 2018 the number of drivers who left ScotRail was more than double the previous two years, This was because of drivers moving to other train operating companies, who offer higher rates of pay than ScotRail". 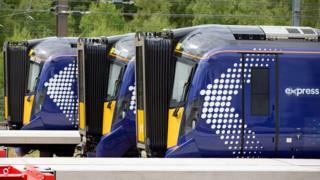 The firm hired 90 drivers last year and is planning on hiring 55 this year, though ScotRail has warned it takes up to 12 months to train them up. Elsewhere, ScotRail has pledged £500,000 to be spent every year on a 'Performance Improvement Fund' to improve resilience. A number of technicians for the new Hitachi electric trains will also be hired in a bid to solve faults quicker. The scale of disruption caused by staff being trained to operate new trains saw an average of 46 services a day axed towards the end of 2018. However, the issue has not gone away with services still regularly being cancelled, particularly on routes serving Fife and the Borders, due to "crew shortages".